The trip to Switzerland was a blast: crystal-clear lakes, glaciers at 4,000m of altitude and awesome food. 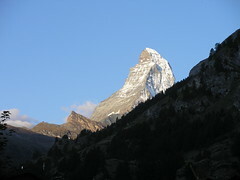 This picture of the Matterhorn was taken from our hotel balcony in Zermatt. - the crafts market in Luzern where I was able to purchase some handspun yarn (the fleece came from the local milk sheep).